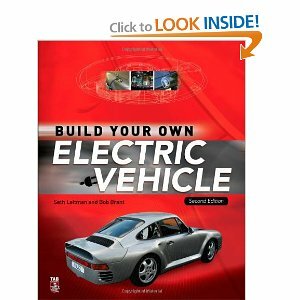 Last month, I finally got my hands on Seth Leitman’s Build Your Own Electric Vehicle book from Amazon.com/. Here’s an interesting fact that I didn’t know about Leitman, he holds a degree in engineering and has worked on the Lunar Rover project. I guess he must be a technical genius. I have always like Do It Yourself (DIY) electric cars and that’s the primary reason I created this blog. Therefore, Leitman’s book is really a great source of information, which will be of immense help if you are interested in learning about electric vehicle conversion. Build Your Own Electric Vehicle Book – What’s Inside? In this slightly over 300 pages book, Seth Leitman has provided information much beyond what can be imagined from the title of the book. Not only the book lists the process of converting conventional car to electric vehicle, it also provides a lot of information related to EVs. To begin with, Leitman investigates the suitability of electric vehicles as far as environment friendliness is concerned. This is followed by a brief description of the history of evolution of the electric vehicles from mid 1800’s to the present time. He has also provided an excellent review of the all the vehicle produced during recent times, till 1993, which is a unique feature of the book. His review also includes the future plan of the manufacturers. One chapter was specially written to guide the prospective buyers with all the choices available in the market – be it absolutely ready to go car from a manufacturer or a Do It Yourself (DIY) enthusiast about the conversion process. According to the author, buying a used EV may be a wise option, especially if you are looking for some cost savings. It is true that these used cars are difficult to get, especially if you are located in someplace outside the big cites on the coast. But if you are successful in spotting such a car, rest assured, your DIY electric car conversion project cost will be remarkably low. As is evident from the title of the book, Leitman has stressed on building your own EV rather than buying a ready one from the manufacturer. To find out which vehicle is best suitable for conversion, he has also compared various vehicles. According to Leitman, a vehicle with a slow pick up is easiest to convert and accordingly, a truck may be the best vehicle to be converted which will give you the best range, provided you are OK with the slow starting speed and it fulfils your requirements and matches your style. In Chapter 5, the book has included an exhaustive list of suppliers, manufacturers, converters and EV clubs which is extremely helpful. But the real content of the book starts form Chapter 6 onwards. Leitman has used all sorts of tools to evaluate the effectiveness of the vehicle that you are considering for conversion. There are formulas and charts that will also help you to choose the size of motor and batteries that will be used for EV conversion. In the next chapter, he has dealt with all the components of the electric vehicles in details, such as the electric motors, controllers, batteries, and chargers. Personally, I think these are the chapters that make the book extremely useful if you are keen to start your own electric car retrofitting project from your garage. The Build Your Own Electric Vehicle book deals with all the practical requirement and information, both for existing as well as the future technologies. So is Seth Leitman’s book a good buy? Well, if you like DIY electric cars, I would highly recommend it. Click on the link below to get your copy from Amazon.com right now. ==> Click here to get Seth Leitman’s book from Amazon.com!